House built by Thrifted Decor and Five Tips for Thrifting! Yes, this home I am about to show you was furnished and accessorized with about 95% thrifted home decor! From second hand shops, antiquing, off the side the road, yard sales, tag sales, Facebook pages you name it! 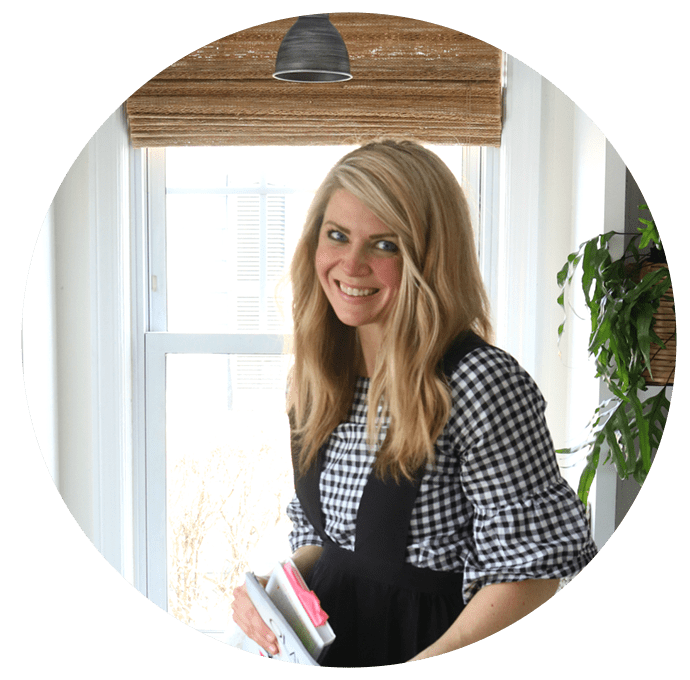 I originally met this client, Amy off of a Facebook post I did when we first moved to Connecticut because I was trying to sell a lot of the extra home decor I didn’t need. She came into my house and bought a lot of things, then she said she stalked me on Facebook and found out what I did! She messaged me for a design consultation and I helped pull all of this thrifted decor together with a design plan. Now I consider her a great friend! Amy is a thrifter and I would call her the BEST thrifter I have personally seen! When I went to her home she had a room in her basement full of amazing accessories she had thrifted and collected over the years. She wanted me to do a design plan for her but she admitted that she would not be purchasing any of the furniture but rather taking my idea and looking for similar THRIFTED items. Which was fine by me, I invoiced her for an hourly rate. GO OFTEN- Goodwill, Savers, etc. put items out daily and throughout the day so there are always new items. BE WILLING TO DIG- There are always hidden gems amongst things you would actually never think to buy & think belong in the garbage rather than being sold. THINK OUTSIDE THE BOX- A vintage, chippy metal container for $1 or $2 might look like garbage but it can be used as a cute planter or crayon holder. TAG SALES- Sometimes the junkiest looking tag sales have the best vintage items & cheap prices. Don’t do a drive by! Get out of the car & check it out. I have found so many amazing farmhouse, vintage items that I repurposed or just simply cleaned up that have become statement pieces in my home. SHOP THRIFT FIRST- Check Craigslist & your local Facebook Tag sale sites FIRST before purchasing big items. I got my big ABC HOME credenza in my living room for $800 from a home in Westport. It was in excellent condition but just didn’t fit in their new home since relocating from NYC. It was originally $3500, SCORE! *I do want to say that I really appreciated Amy being honest and telling me upfront her plan to thrift pieces. That way I didn’t waste my time hunting down the perfect piece- rather I just gave her an idea of what to look for and I charged her by the hour. Designers either make money by billing clients by the hour and making a commission off of the furniture. Or if no furniture is purchased the designers expertise and suggestions does need to compensated with an hourly rate. I no longer offer design services, only to existing clients. Just wanted to share if anyone was curious how a designer works! This is the credenza that Amy was referring to in her tips! Let’s take a look at a lot of the rooms on her main floor. I have helped her with her kitchen, master bedroom, daughters room and outdoor living spaces. But this post is already a lot of photos! So let me know at the end if you are interested in seeing the rest! This is the main family room. I will highlight a few of the thrifted pieces. But literally everything is thrifted. All of her sofa’s are IKEA that she bought off of a Facebook Tag Sale page, both for $300. Coffee table was $30 that I had her paint white. All of the books we accessorized with were about $2 each. The fur stool she snagged at Good Will for $6! The rug is new and can be fond HERE. Below is a BEFORE photo of this family room. The BEFORE I got my hands on it! Everything she had originally was sold to pay for her new thrifted pieces. She took her time to sell everything and then to find the right thrifted decor that fit into her budget and matched the design plan I created for her. But I have to say Amy has great taste and recognizes value and style when she sees it, she just needs the help on pulling the look together. She follows my blog and other designers and tries to look for pieces that she is drawn to or that she see’s being used well! Thrifted lanterns for $15 and glass jugs for $6! Amy is more of a maximalist so with that design style it is important to stick a few colors to avoid looking too busy. Notice in the bookcase I used all of her white, blue and gray accessories and clustered them in sections in the bookcase. Another large pieces of furniture she bought on a Tag Sale website and had it painted white. Target lamps that she found at Good Will. She went looking for a specific size that I told her and found the perfect set! Also the art was a $1o Tag Sale find! Now onto the Thrifted Front Room. The only new item is THIS rug. Everything else is a thrifted find. That bookcase was a $35 tag sale find that she had sitting in her garage. I told her to paint white and bring into this room rather than the dark heavy armoire that she had. It did have doors that she took off and sold for $50! Now it can showcase all her favorite collection of thrifted goodies! She lives about 5 minutes from my house- still very close to the beach. We used some fun little beach items in her decor too that are FREE! Painting the walls in a bright white really made a difference too. See the fireplace screen? Amy found that FREE on the side of the road! All of these vintage bottles were thrifted for $1 each! I decided to make a statement with them grouped on the mantle rather than spread out all over the home. This dining set was thrifted from Good Will for….you ready for this…. $35! Amy did pay $100 to have someone paint it after I suggested going with white. The rug again is the only new piece that is from HERE. Notice that paddle board chalkboard? Amy thrifted that from me! I had a friend sketch a chair with a chalk marker! I am super happy that it went to someone who didn’t erase it and appreciated it as much as I do. 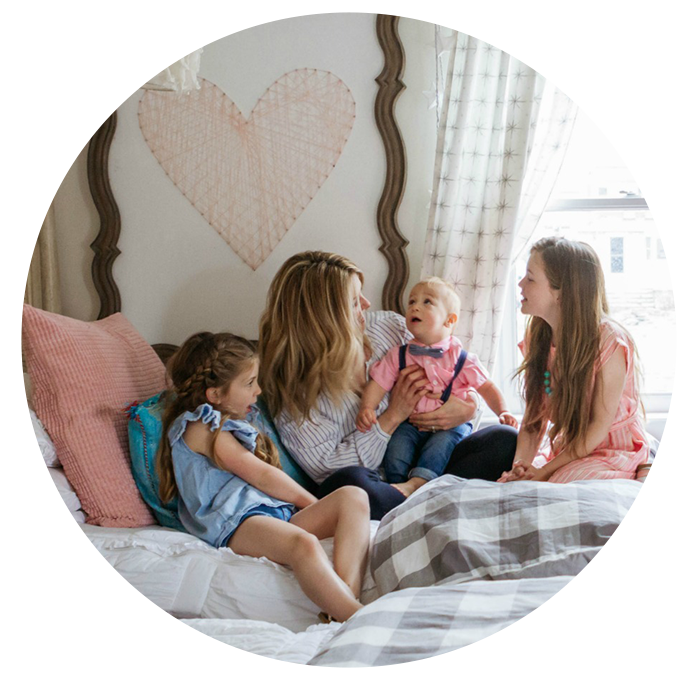 This office space doubles as a playroom for her darling three girls. Before I did the gallery wall around the tv I placed the art on the floor and pretended the tv was on the floor too. I play around with the arrangement for a little bit and made sure it is was evenly balanced by size, shape and color. IKEA storage cabinets were also found on a Tag Sale Site. The rug is new from HERE. The desk is the same one I have but Amy bought her’s at Good Will! Again found the IKEA table and chairs on a Facebook Tag Sale page! Amy has the sweetest dog and had that canvas picture made of her @linney.lollipop that she shares on her own Instagram page! 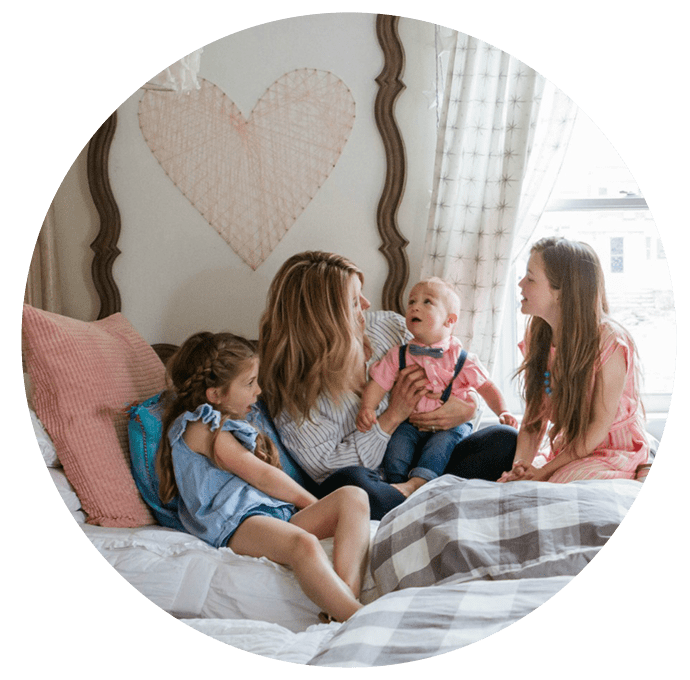 You can follow her there for peeks of her creative side and love for animals and her cute daughters HERE. I really hope you enjoyed the tour of this charming, character filled home! And it left you feeling inspired to make your home YOU! It does not require a lot of money. Amy was so kind to say that I made her house a home. I wish that for every single one of my readers. Love it! Y’all together did a great job. I love these before and after photos! What a transformation! Would love to see more pics, please! So much inspiration! Thank you Brooke! WOW! Fantastic job! Yes – her house looks so comforting and loved. Love it!! Please, I’d love to see more of this thrifted home. You did a great job! Such good inspiration-that has always been a dream of mine, to do a whole house free or very cheap from goodwill, etc.!! Talk about being inspired! Love it! It looks beautiful! You are such a talent and the homeowner has a great eye for interesting items. I would LOVE to see more of her home😊 Thank you for putting out the BEST home decor blog! Really lovely! Thanks for sharing! I love this post! I would definitely enjoy seeing more of this “thrifted” house. I wish my Goodwill had so many treasures. Thanks for sharing! I love this and would love to see the rest of her home. You both did a fantastic job pulling it all together. I love that they are unique pieces picked up at different places that give the space a unique and beautiful look. I’m inspired to stop into my local thrift stores savers! My favorite to date! Love her style and thriftiness! I love this post! Her home is beautiful! It’s so nice to see a beautiful, thrifted home! Hey Brooke! Looks so cozy and comfortable. Y’all did a great job and I love that it was all thrifted! Would love to see the rest of her home and more posts like this. LOVE LOVE LOVE !! Everything is so lovely! I love those IKEA couches so much. So pretty!!! I like when you do home features, it gives me inspiration when decorating! Probably over half of my house is thrifted, so this thrills me to see someone else put theirs together with fabulous finds too. Her home is so charming and inviting. Wow! I am so inspired! Thank you for sharing. I would love to see more of her home! SO pretty! and SO inspiring (heading to the thrift store now)….and yes to seeing more of the house! Love it! Would love to see the rest of the house! Every room looks beautiful, peaceful and well put together, yet still cozy and personal. Love this! That so many things are thrifted is amazing and is inspiring me to check out some local thrift stores! I LOVE this blog post!! I’m feeling super motivated and excited now! Can’t wait to find my own treasures! Thanks for all the great tips! How do you hang pictures on Wall? Always nails? And such a lovely job! yes I typically always use nails! Do you have any idea where the rug in the first room is from? Would love to see the rest of this beautiful home. This is one of my favorite blog post!! Everything just comes together so well! Did she buy the blue rug in first room new or used? It is beautiful! What an awesome home! Would love to see the other spaces you designed and Amy found! Thanks! HOLY SMOKES BROOKE AND AMY! I have gone back through this post several times! Ab-so-lute-ly AMAZING! Only one other blogger has left me with my mouth hanging open like I was while reading this post (Blesser House.) You really did a great job on this one. So, so impressed. Thank you for the tips and all the time it took to put it together for us, the readers. I got so many great ideas and am so motivated. Beautiful. Stunning. Modern. Looks upscale – love the fact that it’s mostly thrift finds. Wow. Not sure you’ll ever top this one. Thanks again! Thank you for sharing these rooms — often I find that “designed” rooms don’t speak to me — but these rooms do. I’m the “keeper of the family relics” (my grandparents and parents “treasures”) and I live in my grandparent’s home, so many of these photos gave me ideas of new ways to use the “relics”. I don’t need to thrift — I have an abundance of special, beautiful things that I just need to group and display differently. I especially liked the tip to stick with items of just two or three colors to keep the room from looking cluttered. I have books that were sent to my grandfather when he was a teen, by his grandfather — they are well over 100 years old. These rooms gave me some ideas of ways to group them with some old toys and antique banks, so that they are a focal point. Thank you and, yes I would very much like to see the other rooms that you’ve done in this home. So beautiful! Love the creativity!! And her home looks magazine worthy! Thanks for sharing this post with the before and after pictures. Very inspiring! These rooms and things were put together by some very talented ladies, who have an amazing eye for taking the ordinary and making it into something magical. Love. It. All. You never fail us Brooke! Love this house! So creative and comfortable . . . and thrifted! Would love to see more! I’m in the middle of designing my new apartment and have had so much inspiration from this beautiful home! Would you mind posting photos of the kitchen as well? I love this one!! Would love to see the rest of the house, I’m so inspired! Loved this post! I loved seeing how all the thrifted items were styled. What a beautiful home! Well done ladies! You couldn’t have done it without each other!!! The end product is unique and stunning! I would love to see more, and I would love to learn more from both of you ladies about thrifting and design–please!!!!! Just shows that taking your time and finding the right pieces pays off. Not only is decorating well on a budget inspiring but it was smart to have a design plan to pull it all together. Great job and loved the post. What a wonderful job you both did!! Thrifting in my are is also great, I live in Worcester county Ma. I find great finds all the time. What a beautiful example of creating a home that doesn’t take money but rather virtues like hard-work, determination and ingenuity! Loved this post! I would love to see more rooms! Beautiful job! Great job! Would love to see her kitchen! I must jump on this bandwagon as well! Love this post and agree with all these comments! Thanks Brooke and Amy! Best. Post. Ever! I love to thrift but it’s easy to end up making my home look junky instead of homey. I love your tips for avoiding this. Also I didn’t know a designer would work with me without me buying anything from them. Now I know I can ask someone to help me arrange my finds and identify what I should look for. I’d love to know how long it took her to get this look once the two of you came up with a plan. Usually it takes years to put something like this together, and I understand she already had a lot of the items, but how long did it take to get this finished look? Thanks! I love this post and all the tips and would love to see more pics and hear more from the owner about her behind-the-scenes experience. Loved this post!!! Iam also thrift store fan and the saying “other peoples trash is someone elses treasure” is soo true! just proves that you don”t have to spend a fortune to have your home look like a million bucks! I also would love to see more of her home-soo inspiring!! Sandee=Fairfax Va. I enjoyed this post too. You did an excellent job! I wished you lived five minutes from me! Thank you for sharing this home! I love this post! There is such a thrill in finding a bargain, but to see all those bargains pulled together so seamlessly is even more of a thrill!! Great job to both of you. I can see this being an ongoing challenge, gathering thrifted items to pull off amazing room transformations. This speaks to ALL of us, no matter where we live, or the type of home, or our income level. Thank you for sharing. I would LOVE to see more of her home. WOW! You are so incredibly talented. This provides so much inspiration. I don’t always have the time for thrifting, but it goes to show that you can find beauty anywhere and it doesn’t have to cost a ton of money. AMAZING! So fun! Clearly I need to hit the Goodwill more often! Please show the other spaces you mentioned at the beginning of your post! hey girl- love the house! so cool! Oh, my! LOVE all the rooms and ideas. Please show the rest of her house. Very interesting post. I’d love to see more. I love her home! You both did a fantastic job. I would love to see the rest of her space sometime. Thanks! We will be sharing it all soon!